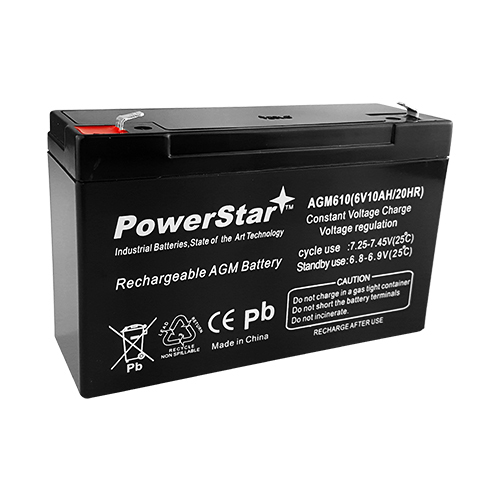 PowerStar Replacement for RBC52 Contains (1) 6V 10ah Replacement Battery. Dimensions 5.92 x 1.94 x 3.92. Replaces-Powersonic PS-6120, CSB GP6120, Panasonic LC-R0612P, Yuasa NP12-6, NP10-6, GS / Portalac PE6V10, PE6V12, Kung Long WP12-6, MK / East Penn ES10-6, ES12-6, Haze HZS6-10, HZS6-12, Union MC-06100, MX-06120 , BB Battery BP10-6, BP12-6. Does not include wiring harness, save and re-use existing wiring harness.